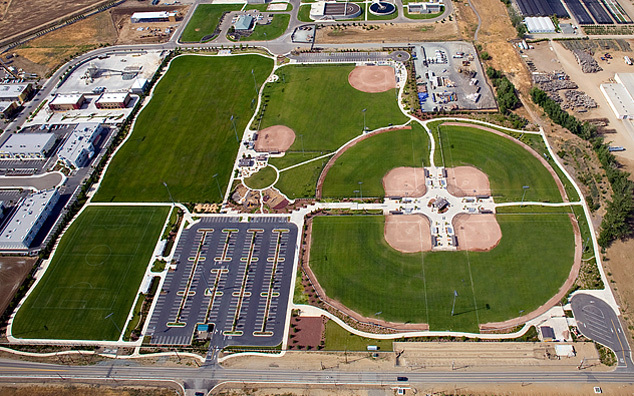 This 38 acre sports facility was developed to serve the increasing demands on the park system in Brentwood. Included in the project are 4 full sized soccer fields, one with sand based Bermuda turf, 4 softball fields, one baseball field, one little league field, two restroom-concession buildings, school aged play area, preschool aged play area, shade structures, and covered dugouts at all softball-baseball fields, equestrian parking and trailhead, and two parking areas for park users. All fields within the park are lighted with low glare/spill lighting to allow evening use.